I really enjoy doing the workshops at Alannahs' place. something to eat, depending if some one feels like cooking. favourite. There are too many to pick from. she imparts her knowledge clearly and precisely and brings a wealth of knowledge as an artist to colour, form and creativity. The class is also a very friendly social event. I especially love the lanterns. but you also have the freedom to add your own style & work at your own pace. Lots of friendly banter too. My fave project?? Gosh, everything!!!! I'm a big fan of Lanna's classes. I just wish I could get there more often. I've made cards for over 10 years now yet Lanna always shows me some new way about it. I like looking at the slideshows of the different card options on the big screen too. 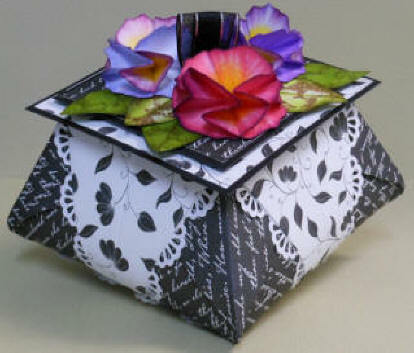 My favourite would have to be the B&W Origami Gift Box with a lid full of double pansies.